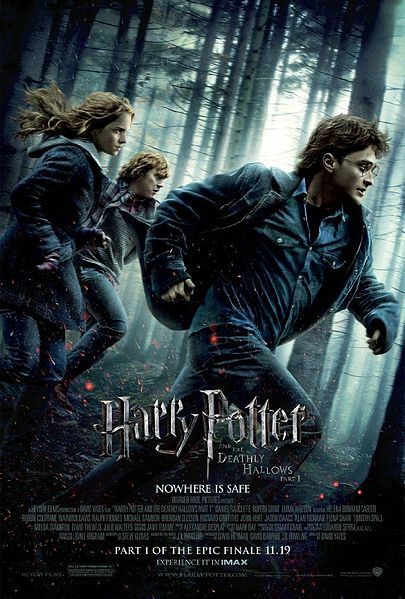 Looked at independently as a movie-going experience, I doubt that the first half of Deathly Hallows would be satisfying for someone who isn’t already steeped in the series. My husband has read all the books, but he’s hardly as detail-oriented as I am, and he thought people who hadn’t read the books would be completely lost watching the movie. But, again, at this point, how many people are going into the movie theatre fresh for the seventh part of a movie series based on a seven-book fantasy series? It’s interesting to me as someone who used to watch soap operas and read more serial super-hero comics, where the argument was always that every issue or episode was possibly someone’s first, so there should be a fair amount of exposition to help those newcomers get comfortable. I don’t know that this is possible with Deathly Hallows. It’s packed in terms of event. I was surprised at how much of the novel Yates and screenwriter Steve Kloves managed to include in the movie without any drastic cuts or marginalization of the events’ import. And they still found a lot of time for moping in the back country, even though those sequences didn’t do the young actors any favors. Speaking of the young actors, I’m always a little confused when critics talk about how marvelous they are and how fascinating it will be to see their careers evolve. I think in the case of Emma (Hermione) Watson and Daniel (Harry) Radcliffe, they were cast very well. Of the three, I think Rupert (Ron) Grint is the best actor by a fairly wide margin. Radcliffe may be more comfortable on stage, and Harry is kind of a thankless role and character to begin with, so it’s hard to tell how good he could be under other circumstances. I’m convinced that Watson has been badly directed since fairly early on in the franchise. As written by Rowling, Hermione doesn’t have the dour gravitas Watson conveys in the films. Book Hermione is intelligent, task-oriented, and purposeful. She doesn’t seem to view the fact that she’s vastly smarter than her companions as a grievous burden, and the delight of the books’ version of the character is that she isn’t troubled by it. She’s just smarter; it’s what she brings to the table, and, more than any other character, she understands that Ron and Harry have their own strengths. Movie Hermione always feels like she’s hauling the others along, trying not to hurt their feelings with her higher skill level and more advanced understanding of their grim circumstances. It robs the audience of the fun of realizing that Hermione is hauling the other two along because of the conscious burden it places on the character. But I was surprised at how much better certain moments worked in the film adaptation than the novel. A death in the opening chase sequence is miles better than Rowling’s original writing of it. Briskness helps a caper sequence in the Ministry of Magic, along with the terrific, possibly satirical work of three adult actors playing Harry, Ron and Hermione in disguise, particularly David O’Hara as the wizard Harry is impersonating. And the earlier introduction of house-elf Dobby makes his later appearance work even better than it did in the book, though I was disappointed that he was costumed in a dishrag rather than in one of his more dapper ensembles indicating his status. On the down side, I still like Evanna (Luna) Lynch very much as a presence, but I think the character is being marginalized. I’m not sure if there’s anything Bonnie Wright could do with the character of Ginny. If Harry is a thankless role, Ginny is even worse. But overall, I enjoyed the movie. I don’t think any new arrivals to the franchise will find it remotely satisfying, but for a Potter nerd like myself, it was a definite improvement on previous installments from Yates. You are currently browsing the The Manga Curmudgeon blog archives for the day Monday, November 22nd, 2010.